The Ivory Coast produces about 1.7 tons of cocoa yearly, which is 40% of the world's annual global output. 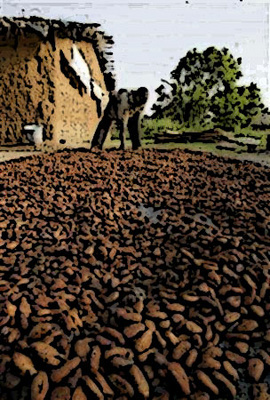 Approximately 50% of the Ivorian population (about nine million) depend upon money from cocoa for subsistence, but ever-falling prices in the world market has left a majority of the population living below the poverty line of less than $1 a day. Farmers are so poor that many are not even able to send their children to school despite their hard work. Anaproci, the largest farmers' trade union, has frequently argued that Ivorians are merely working for the foreign markets that buy their produce at a give-away rate to make chocolate. During a press conference announcing a nationwide strike in 2004, the union commented that the only reason keeping Ivorians in the cocoa farms is that there is no other gainful activity. A recent increase in export has forced the union to call a new strike on October 16th. In the first move to enforce the strike, farmers blocked motorways and prevented cocoa from being transported to the ports. Warehouses close to the port were opened, but were reported by state radio to be empty. The farmers, since 1999, have been able to block cocoa from getting to the ports in similar strike actions. The strike came after the Ministry of Agriculture and industries launched the cocoa season during the weekend by setting the official retail cocoa price far below the already disputed rate of 400 CFA francs per kg, down from 540 CFA francs. Farmers were expecting to see at least 600 CFA francs for this year. "The farmers demand a significant price increase. They want [at least] 600 CFA francs per kilogram," said Henri Amouzou, President of Anaproci, while announcing the strike action. Amouzou warned that the strike will not be called off until the government slash the new stringent export tax of 45%, which is preventing producers from paying farmers a higher retail price. However, the government, while introducing the tax, called for understanding arguing that it is the main source of revenue. Nevertheless, there have been concerns in the past that the money is being siphoned to the wrong quarters, such as purchasing arms to fight rebels. Charles Diby Koffi , the country's finance minister, hinted earlier this month that this remains one of the objectives of the tax increase, "The country is still in crisis. A cut can't be done this season." Last month, Abe Silaye, a Ghanian economist, called on the four leading African cocoa producers, Ivory Coast, Ghana, Cameroon and Nigeria, to form a buffer stock to combat "world price marginalisation". He wrote that the governments of this country must open a fund to buy all produce, even if the world market is unable to pay a reasonable price. In one radical move, he even suggested that produce be burnt up, if the warehouses are filled up. Along with the new low price, cocoa farmers across the country are also struggling to eradicate a new cocoa virus, known as the swollen shoot virus (SSV), as if they didn't have enough to fight already.